Hello Queer Vegan Food readers! It is a joy to write to you from Berkeley, Calif., where it is currently foggy and mild temps. This August is super special for me, because it marks my six-year vegan anniversary! Six years isn’t very long in the scheme of things, but as a twenty-four year old, that’s 1/4th of my life spent eschewing animal products in food, products, clothing, and trying my best to support animal welfare whenever possible. It’s been an incredible journey, and I thought I’d take this opportunity to share a bit about my journey to veganism, and say a bit about what being vegan has meant to me in my life. I became vegetarian at age 12 after my older brother Asher convinced me it was just plain silly to eat meat. I am grateful for my amazing big bro for many, many reasons, but his cajoling me to drop the dead flesh in my life was a huge gift. Thanks, Asher! My vegan brother Asher's LA film studio, Pollution Studios. My vegan journey officially began at 18. I was working as a sailing instructor at a camp which served absolutely the nastiest processed food ever. It was deep fried everything, vegetables drenched in butter, sugar cereals and lots of meat, eggs, and other processed foods. It was a nutrition disaster for everyone, and as a vegetarian I started to get really jealous of this vegan girl who was working as an assistant counselor. She had absolutely no choice but to buy her own food, and what she was eating looked so much better! While I was picking at the iceberg lettuce at the salad bar, this chick was noshing on fresh fruits and veggies, organic cereals and nut milk, vegan cookies, even. She seemed happy, healthy, and very energetic. Before I could ask her why she was vegan, her session ended and she was gone. I suddenly had to know why this girl was vegan and not vegetarian. Was there something I was missing? I went online and researched vegan primers. The first one I saw was what I ordered: Vegan Freak by Bob and Jenna Torres. After reading it, I realized that for all of the reasons I’d decided to be vegetarian (animal welfare, environmental concerns, social justice) it was just plain hypocritical of me not to go completely vegan. Some people have a hard time transitioning away from animal products and do it gradually; I totally respect that, but that wasn’t how it was for me. As soon as I put the book down, I knew what I had to do and didn’t look back. As most vegans can attest, veganism can feel liberating on all levels, not only in the sense that there’s an abundance of foods, products and opportunities that are available to us vegans, but also in that it provides the feeling of doing everything in our power to reduce harm we cause to animals and non-human animals through consumption habits. As a vegan, I have met tons of incredible people such as my idol and author of The Sexual Politics of Meat Carol J. Adams, and have gotten the chance to do activism through writing, hosting events, and being that visible presence that can be a catalyst for change for others. My brother, once vegetarian, is now vegan (way to go, bro!). I’ve helped some of my professors at Vassar come out of the vegan closet, and have nudged more than a handful of friends, many of whom are still vegan! For me, veganism has always been primarily about animal welfare and environmental and social justice concerns. Luckily, it is also a path to healthful nourishment. When I learned about raw foods, it made my vegan experience even more fun and enjoyable, and now I incorporate a high-raw diet into my vegan activist diet. It’s pretty cool to make the connection between what’s on our plate and how it got there, and whether you’re eating mostly cooked vegan foods, raw vegan foods or a combination of raw and cooked vegan foods, I feel the key is to feel great about the choices you’re making for yourself and for the planet. 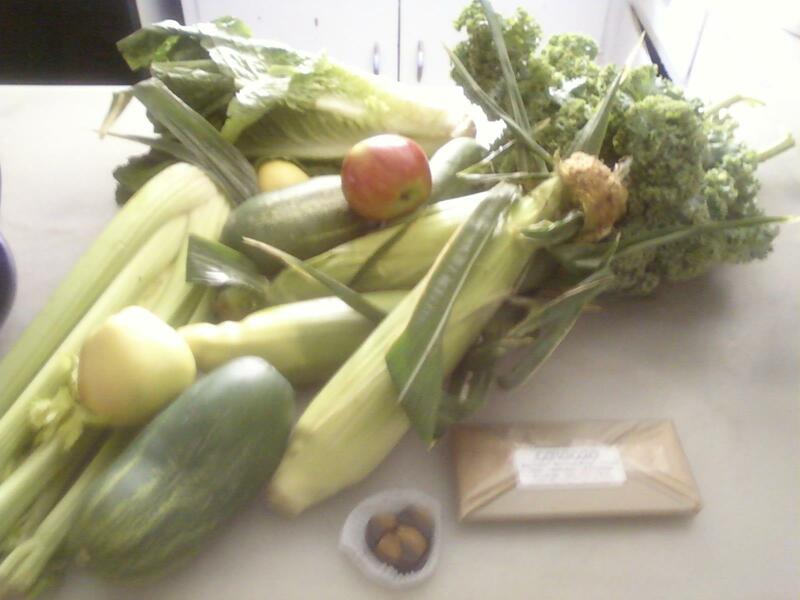 One of the things I’ve realized as a vegan is how much of a privilege it is to have access to raw, organic vegan produce. Sadly, the way our twisted food economy is set up, many low-income communities just do not have access to their basic human right to healthful, nutritious produce. Food Empowerment Project leader Lauren Ornelas makes great efforts to make vegan food accessible, and my new favorite champion of raw foods for everyone, Brandi Rollins, has a sweet new book out with ingenious strategies to live an exclusively raw organic vegan diet or incorporate more raw foods into your diet without breaking the bank. My vegan inspirations include AJ from Queer Vegan Runner, a fellow Vassar grad who shows how living a vegan lifestyle can help reduce cruelty towards animals and can also make you fit to run many miles and enjoy life! My friend Allen, whose epicurean blog Le Seitan Au Vin never fails to crack me up (wish he’d update it more..it’s SO good!) and I used to throw juice parties for our creative writing group at Vassar with our friends Nate, Joshua, and Ladee I am also inspired by JL Goes Vegan, whose entertaining and information-filled blog highlights the good life as a smart, sassy warrior woman who went vegan post-forty. 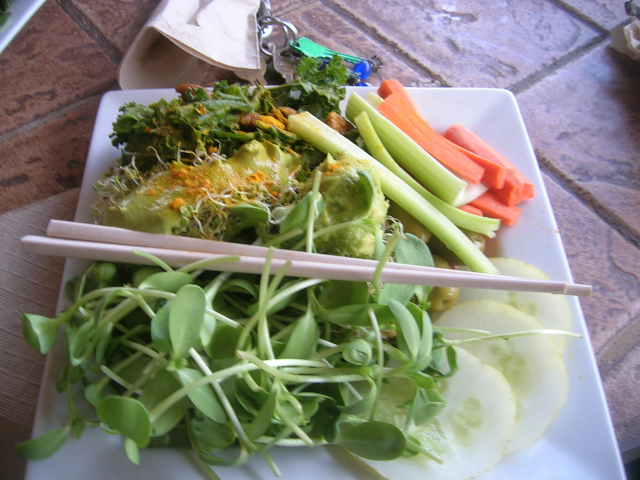 Raw vegan salad at The Tree of Life Cafe in Patagonia, Ariz.
Our Hen House is a fellow queer vegan blog that blends activism with sass. I couldn’t neglect to include nutritionist/doctor-to-be and editor wiz Gena Hamshaw’s super amazing raw vegan and vegan blog Choosing Raw, which has helped thousands of people make the connection between deliciousness and veganism. Gena’s blog is also very special because of its section Green Recovery, which highlights stories and insights that show how veganism can help people heal from eating disorders. Groundbreaking work, indeed. Whenever I need a good dose of vegan laughter or inspiration, I turn to SF-based vegan blog Vegansaurus (I’m also a semi-regular contributor as their ‘raw correspondent’). Laura Beck and the team prove veganism can be hip and hilarious. My good friends Ivory King and Jonathan Mann have created an amazing song called “Vegan Myths Debunked,” which highlights the common myths around veganism with a tune that you’ll be humming in your sleep. I have to give a shout out to my amazing partner and best friend Courtney Pool. Courtney is coincidentally also celebrating her six-year veganniversary this month! Her beautiful blog Radical Radiance inspires people with her insights, anecdotes and mouth-watering pictures. She also coaches and teaches about the benefits of juice feasting and fasting and cleansing on a vegan diet, which can be helpful for longtime vegans and gateways to the vegan path for those interested in health. Courtney’s new blog, Spirulina Junkie, is really exciting for vegans, as it explains how to incorporate protein and nutrient-rich spirulina into our diets, and teaches how spirulina can be grown sustainably and cost-effectively to improve global human health and the health of our planet. 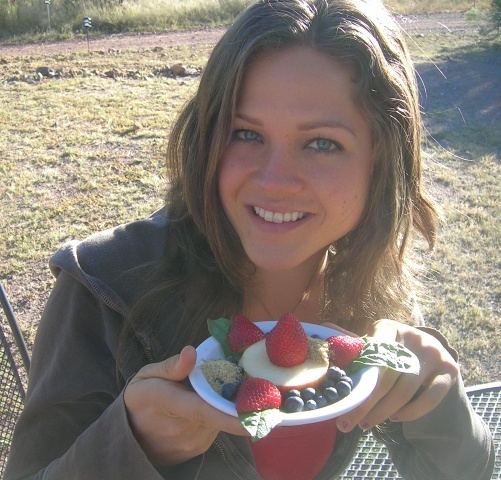 Raw vegan goddess and nutrition coach Courtney Pool. I am also grateful to raw vegan holistic medical doctor Gabriel Cousens, M.D. for leading the way with the links between veganism, spirituality and health, Co-Founder of Vivapura Chris Whitcoe, raw vegan chef/author and holistic health champion Elaina Love of Pure Joy Planet, Aviva and Yosef Funke for their work in bringing holistic health and vegan nutrition to under-represented populations of youth in Nogales, Arizona. I also am super inspired by my dear friend Mariano Caino, who proves you can be a very happy and healthy vegan in Buenos Aires, Argentina! 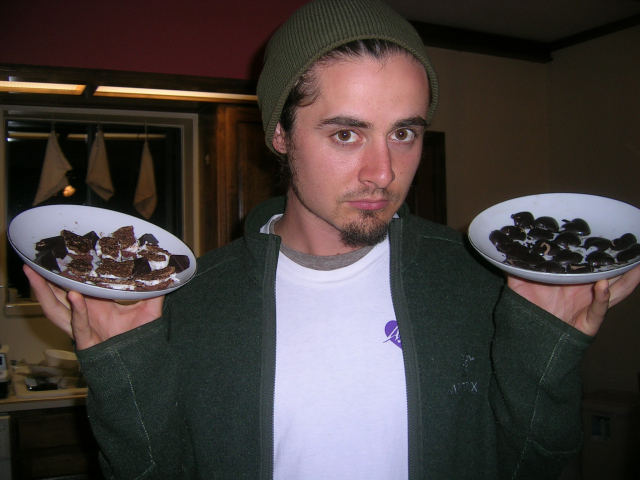 My friend Boaz Love-Bliss with homemade raw vegan chocolate! In addition to everyone I’ve mentioned here, there are many other bloggers and writers whose work has inspired me and is really helping the vegan movement. I wish I could fit them all into this post! Thanks to them (and to you, reader!) for promoting compassion. Hitting up farmers’ markets and learning how to grow our own produce are goals that I think would be great for more vegans to incorporate (many already do), but however we get our plants, it’s an enormous help just to avoid participating in animal exploitation. In the comments, I’d love to hear how long you’ve been vegan or vegetarian! Thanks for reading.